The Motogadget wants to see an almost perfect switch for its speed input signal. That means you'll have to design an opamp based circuit to accept the low voltage, low current sinusoidal output from the Variable Reluctance sensor on the rear drive and convert that to a very high impedance output. This implies a Vcc for the opamp between 5V - 14V (your choice based on your design) and the opamp needs to drive an open source N-channel MOSFET. That way, the Motogadget will see an output impedance of infinity with the MOSFET off and 0.5 Ohms or so when conducting. 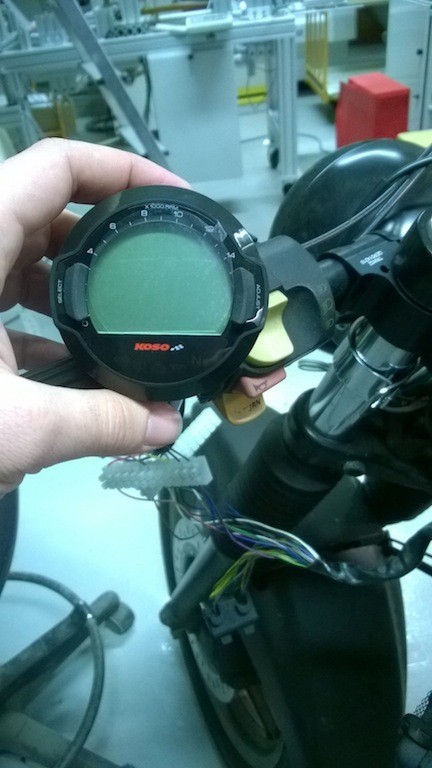 It was the information I was missing, the motogadget sensor is not only a magnet, and need voltage to works . thank you. The Motogadget speed sender is a reed switch with magnet. The magnet passing by the switch engages the switch, makes the contact and causes a pulse count in the instrument. The OEM sensor outputs a sine wave, the frequency of which is proportional to the road speed. The two signals are completely incompatible unless one is transformed into the other. Thanks for the previous answers ! Four. There should be a ground reference on the circuit board. I made the circuits, I don't have any speedometers for the moment but it seems to works well ! I think it's incompatible because it works with a passive speed sensor, do you agree ? From the instructions, it appears that the meter is capable of accepting two types of speed sensors -- passive and active. The passive will be a simple reed switch that senses magnets placed on the wheel. It can output up to 6 pulses per revolution. The active sensor will sense the nearness of metal parts and can output up to 20 pulses per revolution. The circuit you built will emulate the active sensor and can possibly replace it. The interface on the speedometer will probably have 3 wires - power ground and sense. The circuit you built will not need power so you connect the output to ground and sense. I'd advise you to talk to Koso technical support to get answers to any of your questions prior to buying the meter, so that you are sure you're installation will go problem free. Interesting project ! New here and new to K bikes. If one was to integrate all desired features into one system perhaps an Arduino or Raspberry Pi based system with a LCD display would be worth looking into. Bluetooth, GPS, RFID, accelerometers and other sensors are plentiful and cheap. Could also be a basis for a HUD. Just getting into Arduino myself so I can't tell you how .... yet. Read my blog page on the Brickuino I designed and built to work with my K75. nice blog page! lots of good info there! Great blog, great work As I am new here I should read all before posting ! I am in the progress of installing a KOSO GP style speedo and I would very much like to use the built in speed sensor on my 1991 K75. The speedo came with a passive speed sensor which can read up to 6 pulsations. It has an optional active speed sensor which can read up to 20 pulsations. From reading this subject I understand that it should be possible to use the original bmw speed sensor if I built a board. Can somebody help me with a diagram of what I should built in order for this to work? this is my first post/reply/ question ... I've done my research and read as much as i can. there has been discussion of what happens when removing the gauge cluster... which I've been riding around with out for a two weeks (waiting for me new after market) gauges to arrive. it didn't dawn on me that the alternator would stop working due to no bulb in the circuit. i haven't died yet but who knows when that will happen. I love my Brick ( its my first despite owning and building 17 motorcycles from scratch) i really don't love the gauges as they and bulky. Is there a quick or slow fix to work around this. i haven't died yet but who knows when that will happen. If it's any comfort, you aren't alone. None of us really know when that will happen. there has been discussion of what happens when removing the gauge cluster... which I've been riding around with out for a two weeks (waiting for me new after market) gauges to arrive. it didn't dawn on me that the alternator would stop working due to no bulb in the circuit. i really don't love the gauges as they and bulky. If you can put the stock gauge in while you wait. Do that. From what i understand, the charging circuit runs through the light on the original dash. Which is a 3W globe. So to emulate that circuit, you'll need something like a 120 Ohm / 3 Watt resistor. This gets wired between the BLUE cable from the alternator and any switched POSITIVE. I'm in the process of doing this to my bike so i'll keep it updated with results. I saw this suggestion from another thread. Check it out and see if can help you. RBM, I'm thinking about using one of the various Trail Tech units. Are there any issues using one of these relays for the "start in neutral emulation" circuit? They're plentiful and would be a compact option with or without the base. This is a power switching relay and is oversized for the application. The contacts are rated at 120V/5A which is 600 Watts or about 0.8 HP. The Start in Neutral relays only have to have contacts rated at 12V/1A max. In any case, it is also a 4PDT. You'd have to have four of them to get the functionality meaning they collectively would take a huge amount of space in the relay box (if that's where you'd locate them). I think these are a poor choice for the application, even if they are plentiful. This looks like a good solution to getting a conditioned signal to the tachometer input on your gauge and it appears to work with a number of different ignition systems. I think the price is fair for what they are providing. It probably has some quantity of electronic components inside it to perform the signal conditioning. Others have managed to condition the signal coming off the coil primary, and I have helped a guy with his K75 to get the tach working by wrapping 6 turns of 18AWG wire around Cylinder #1 spark wire. The MSD pickup tooks to be a very universal solution. RBM, thank you for taking the time to reply. Comparing my relay to the neutral function schematic, I can see that you are right. I need the three separate 'gear position switch' grounds to energize three relays minimum, to complete the circuit. (Not knowing the inner workings of the 'gear position switch', if I could use only one of the grounds, I could use just one relay). I'm assuming there is a triple ground redundancy to ensure that there isn't an accidental starting while in gear. Thank you for weighing in on the MSD GMR pickup. It appears to require an rpm pulse per revolution setting of "1". The Trail Techs seem to provide a .5, 1 and 2 PPR. RBM, do you have any of your 'start in neutral' circuits available to buy? Yes, I have three available at the moment. And more printed circuit cards are in the mail to me ready to be completed once they arrive. The TGPI switch is a three pole rotary switch that has contacts arranged in a circular pattern. The wiper arm inside the switch rotates via an axle protruding out of the transmission. As each gear is selected, the axle rotates a few degrees, and positions the wiper over a patterned set of three contacts. The pattern reproduced by the contact arrangement mimics a Binary Coded Decimal (BCD) truth table. BCD is a very common method in computers to digitally represent a number between 0 - 7. For the K-bike transmission, there are 6 gear positions - Neutral and 1 - 5. The circuit inside the OEM cluster translates that pattern into gear numbers and neutral. Neutral is equal to Gear 0. The circuit detects this state and does special things when it is detected., exactly the same way the relays do, my circuit does and Maru's Brotbox does. Ahhh, that makes sense. So the TGPI works for each gear as well as neutral and the three wires are required...thank you. I am trying to replace the OEM speedo of my K75 with a Daytona Velona speedometer using original speed sensor, and also I have some led lights in order to replace the functions of the original velocimeter. Do you know how I can make it work? I'm rather new with electronics, so any help with the scheme of the circuit will be highly appreciated!